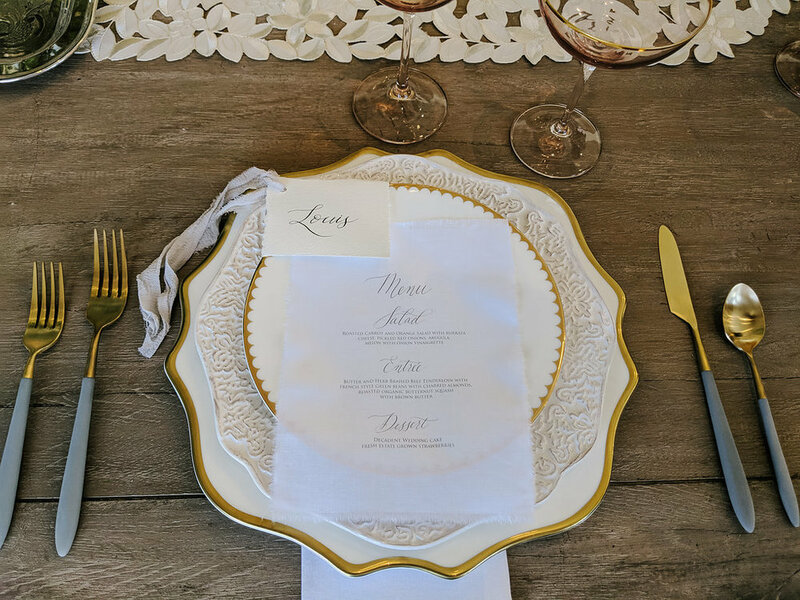 With a nod to old-world design, this elegant setting has a timeless French influence, natural light and soft colours, captured exclusively on Google’s new Pixel 2 phone by Gingersnap Photography’s, Jenny and Colin Hayles. This cutting-edge technology produces captivating images, but remains user-friendly and highly accessible for the average photography enthusiast and those who want to share with their clients beautiful photos immediately. The editorial feature on Google is found here. Styled by Jacqueline Rae Weddings, Events and Interiors, the tablescape was set on a rustic wood table framed by Louis dining chairs from Modern Luxe Rentals complemented with a blush coloured wreath over a navy velvet bench. Fall for Florals provided the stunning centerpiece – a masterful bouquet of white roses, hydrangeas and wild greenery. Skilled calligrapher, Debbie Wong Designs created the entire Parisian-inspired stationary suite, including a stunning collection of invites, nametags, and menus printed on linen. Served on a unique mirrored platter was a truly exquisite cake, delicate and romantic with layers of textured white icing. Bake My Day took it a step further and also provided delectable croque en bouche and mocha Paris-Brest pastries. Surrounded by furniture from Modern Luxe’s new French Colonial line, the cake was presented on a tufted ottoman, alongside champagne coupes, an assortment of florals and some light chiffon. With a host of chemistry and energy, our models were dressed to impress, especially the bride in her Made With Love dress from Pearl and Dot Bridal Boutique. This gown was stunningly intricate, accented with a romantic veil and fine art pieces throughout the train. 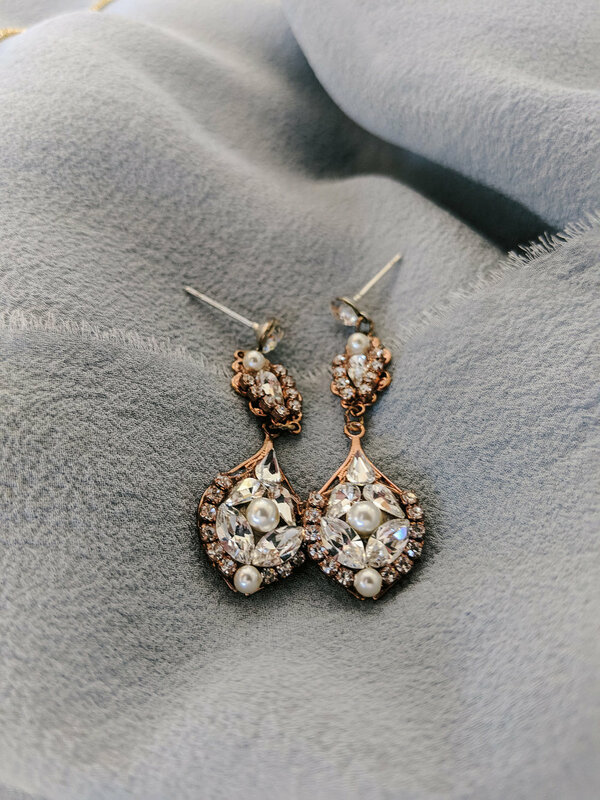 Our bride’s dazzling earrings were provided by Pearl and Dot, and her vintage gold jewellery – rings, small studs and gemstone necklace – came from Apostle Boutique. Jessie Liao Hair & Bridal finished the look with a soft updo and Something Borrowed Beauty added dramatic makeup and lashes. Our handsome groom was outfitted in a sharp, classic suit from Ed Williams Men’s Wear, complete with a velvet tie and fabric flower. While the smartphone will never replace digital and film photography, the Google Pixel 2 is a remarkably effective camera. The images from this photo shoot are top quality and staggeringly beautiful. Just ask the experts at Gingersnap Photography – the Pixel 2 is a great option for weddings, making editing, viewing and the transition to social media simple.